Big Sky Tower is part of the Resort Extrusion family-aluminum frames for Silicone-Edge Graphics (SEG). Custom-made on the premises, Big Sky Tower comes in varied sizes. 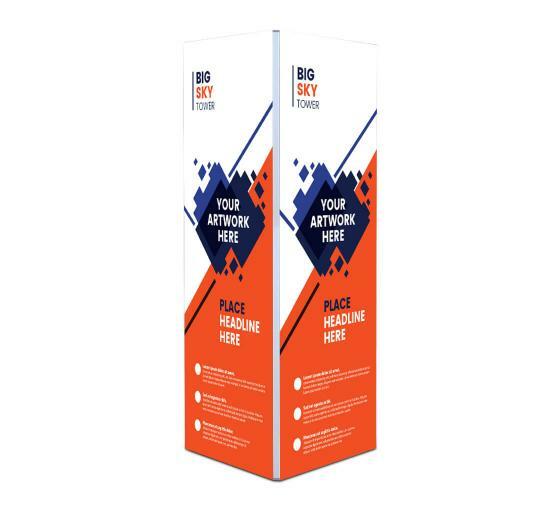 Big Sky Tower accepts four individual custom fabric graphics, excluding top and bottom. Insert graphics after frame is constructed by tilting it on its side. Transversely, push corners of graphic into the frame's recessed groove. Then, starting midway on the frame going toward the corners, continue pushing in the straight edges of the graphic. Repeat three times. Backlit option is available.